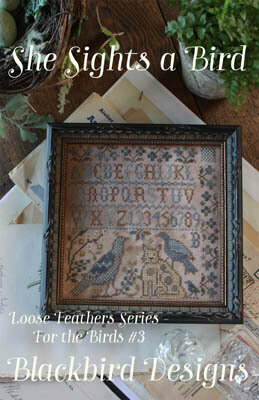 Stitched on 32 count Sandpiper Linen by Birds of a Feather with DMC floss and Gentle Art Sampler Threads. The stitch count is 116W x 81H. "Quaker Family Register" stitched on 36 Ct. Veldt linen with Weeks Dye Works Caper, Confederate Gray, Dirt Road, Loden, Parchment, Schneckley & Straw. Stitch Count: 178x159. 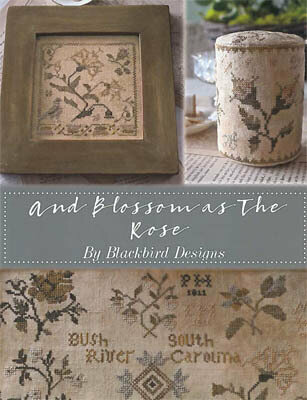 "And Blossoms as the Rose" stitched on 32 Ct. Veldt linen with Weeks Dye Works Caper, Confederate Gray, Dirt Road, Loden, Sand, Sanguine, Schneckley & Straw. Stitch Count: 136x56. "Lily of the Valley" stitched on 32 Ct. Veldt linen with Weeks Dye Works Caper, Confederate Gray, Dirt Road, Loden, Sanguine, Schneckley & Straw. Stitch Count: 73x74. "And I Will Love Thee Still" stitched on 32 Ct. Veldt linen with Weeks Dye Works Dirt Road, Loden, Sand, Sanguine & Straw. Stitch Count: 120x9. Finishing instructions included. "The Scarlett Letters" - Stitch Count: 85W x 200H. 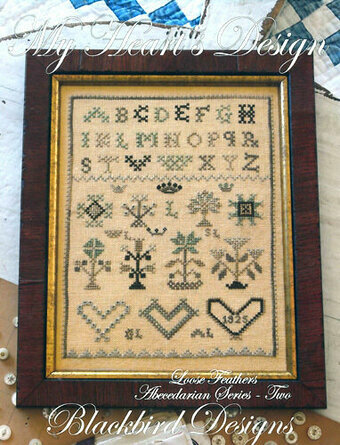 "Alphabets" - Stitch Count: 85W x 127H. "Floral Sewing Box" - Stitch Count: 85W x 80H. 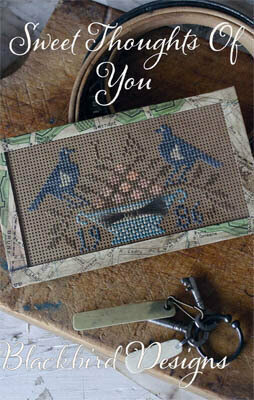 "Love Birds Pinkeep" - Stitch Count: 55W x 68H. All stitched on 30 Ct. Straw by Weeks Dye Works using Gentle Arts Sampler Threads. (DMC alternates are 932 304 3787 3021 3781 420 3750 3790) Note if stitching all the designs you may need more than one skein of each. 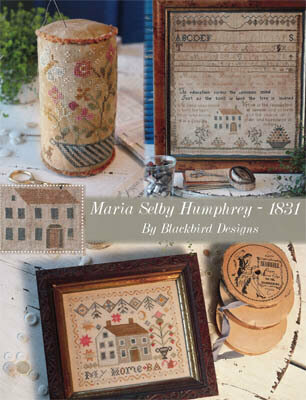 "Maria Selby Humphrey 1831" sampler stitched on 30 Ct. Norfork Blend by R&R Reproductions with Gentle Art Sampler threads (Apple Cider, Cidermill Brown, Flax, Grasshopper, Heirloom Gold, Mountain Mist, Parchment, Picnic Basket, Piney Woods, Tin Bucket, Toffee, Uniform Blue, Espresso Bean). Stitch Count: 284W x 293H. "Summer in Bloom" Drum Pinkeep stitched on 28 Ct. Dill by Picture This Plus with Gentle Art Sampler threads (Antique Rose, Apple Cider, Caramel Corn, Dried Thyme, Grasshopper, Lexington Green, Mountain Mist, Old Red Paint, Otter Creek, Toffee, Parchment). Stitch Count: 128W x 69H. "My Home" stitched on 30 Ct. Abecedarian by R&R Reproductions with Classic Colorworks floss (Fool's Gold, Tennessee Red Clay) and Gentle Art Sampler threads (Apple Cider, Endive, Garden Gate, Parchment, Pomegranate, Tin Bucket, Toasted Barley). Stitch Count: 93W x 83H. Sampler stitched on 28 count linen using Gentle Art Sampler threads & Weeks Dye Works. Stitch count: 120w x 84h. 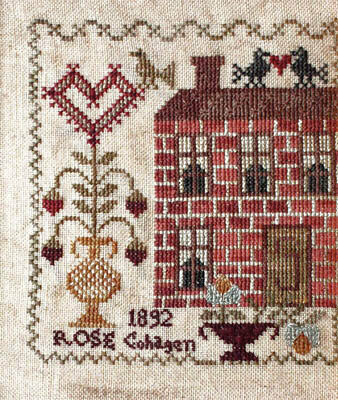 "Eve's Pinkeep" stitched on 32 Ct. Winter's Brew linen with Gentle Art Sampler threads Burlap, Pomegranate, Sarsaparilla & Woodrose. Stitch Count: 23x36. 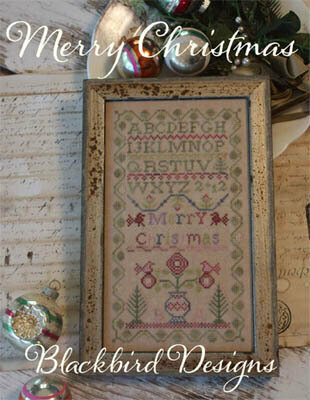 "The Gift is Small" stitched on 32 Ct. Winter's Brew with Gentle Art Sampler threads Burlap, Pomegranate & Woodrose. Stitch Count: 31x19. 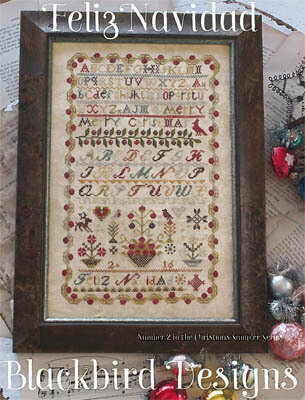 "Shall I Compare Thee to a Summer's Day" stitched on 32 Ct. Winter's Brew with Gentle Art Sampler threads Burlap, Cidermill Brown, Freedom, Garden Gate, Pomegranate, Sarsparilla, Shaker White & Woodrose. Stitch Count: 115x78. 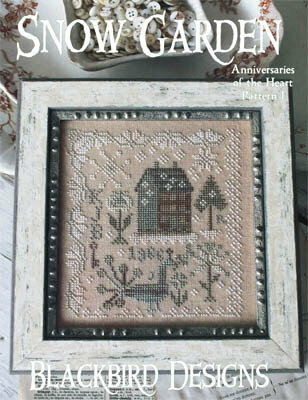 "Darling Buds of May" stitched on 32 Ct. Winter's Brew with Gentle Art Sampler threads Burlap, Freedom, Garden Gate, Grasshopper, Pomegranate, Sarsparilla, Lambswool & Woodrose. Stitch Count: 92x81. Finishing instructions included. Model stitched over two on 36 Ct. Legacy by Picture This Plus using Weeks Dye Works floss (or DMC 3721, 469, 729, 3023, 315, 3046, 898, 733, 434, 372, 3740, 501, 712). Stitch count 125x203. Model stitched on 32 Ct. Korty's Special Blend by R&R Reproductions using Gentle Arts Sampler threads (or DMC 680, 918, 371, 3011, 400, 832, 869, 900, 3790, 433, and 3021). Stitch Count: 95W x 93H. Part 12 in the Abecedarian series. Model stitched on 30 Ct. Korty's Special blend by R&R Reproductions, stitched over two using two strands of floss. #10 in the Loose Feathers Abecedarian series. Model is stitched on 30 ct Iced Cappuccino using Gentle Arts and Weeks Dye Works. Stitch count: 65W x 81H. Part four in the the Loose Feathers Abecedarian series. Model stitched on 30 ct Sheep's Straw using Classic Colorworks, Gentle Arts & Weeks Dye Works floss. Spring 2012 Loose Feathers series. 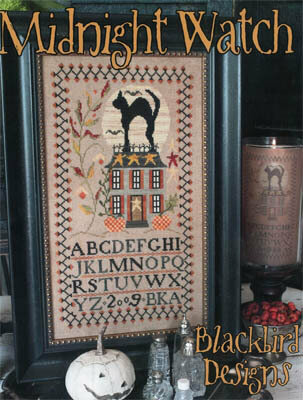 Includes -(1) Mary Ann Blackburn - Stitch Count: 142W x 157H. 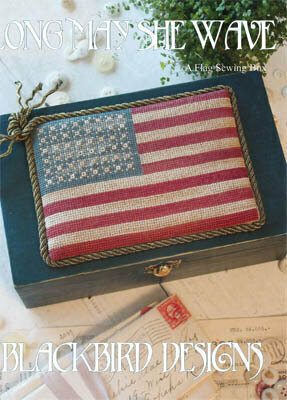 (2) Perching - Stitch Count: 53W x 39H and (3) Spring's Song Jewelry Box - Stitch Count: 126W x 73H. All models stitched on 30 Ct. Sheep's Straw Linen with Crescent Colours, Gentle Art Sampler threads, and Weeks Dye Works. 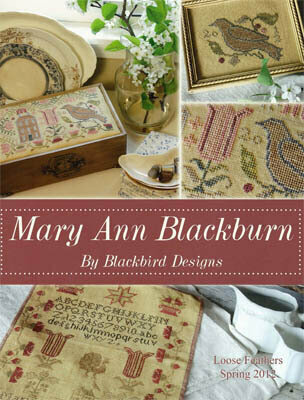 Associated items listed above are for "Mary Ann Blackburn." Model stitched on 30 count Sheep's Straw Linen by R&R Reproduction with Classic Colorworks thread, and Gentle Arts Sampler Threads. Stitch count is 44W x 99H. Model stitched on French Vanilla by R&R Reproductions with Classic Colorworks or DMC floss (3830, 3772, 839, 3864). Stitch Count: 57W x 78H. Sampler stitched on 30 Ct. French Vanilla linen. 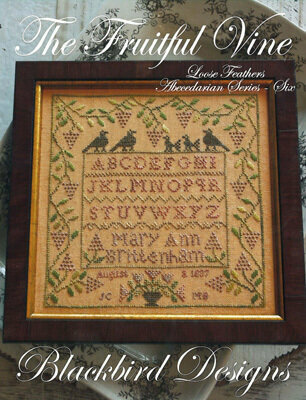 Sampler on the box lid was stitched on 40 Ct. French Vanilla linen. A Sewing box with two extra pincushions. Model stitched on 30 Ct. Confederate Gray by Weeks Dye Works with Gentle Art Sampler threads (or DMC 839, 3371, 3826, 829). 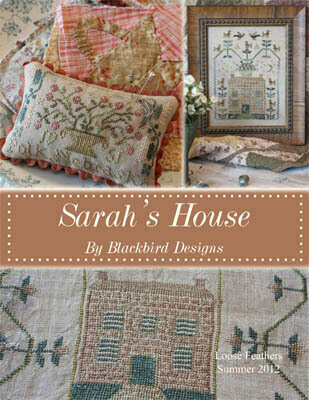 Sarah's House is the second of the 2012 series of four Loose Feather Booklets which revolve around Antique Samplers. 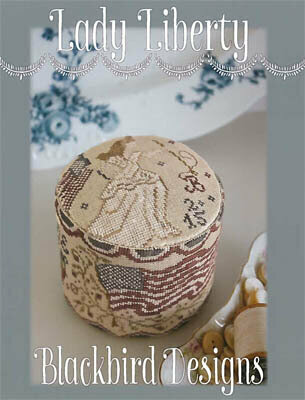 Polk, Nebraska-pincushion (stitched on 30 ct Abecedarian blend using Belle Soie threads) Stitch count 75 x 47. Patterns for 3 stockings - "Bless the Harvest" was stitched on 30 Ct. Korty's Blend with Classic Colorworks (Clay Pot, Pea Pod, Ye Old Gold), Gentle Art Sampler threads (Toffee), and Weeks Dye Works (Lancaster Red). Stitch Count: 46W x 78H. "Mr Turkey' was stitched on 30 Ct. Ligonier Latte with Classic Colorworks (Clay Pot, Pea Pod), Gentle Art Sampler threads (Brethren Blue, Cidermill Brown, Toffee, Wood Trail), and Weeks Dye Works (Lancaster Red). Stitch Count: 45W x 73H. 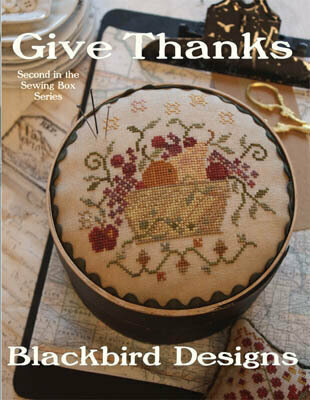 "Thankful" was stitched on 30 Ct. Old Mill Java with Gentle Art Sampler threads (Onyx). Stitch Count: 40W x 74H. 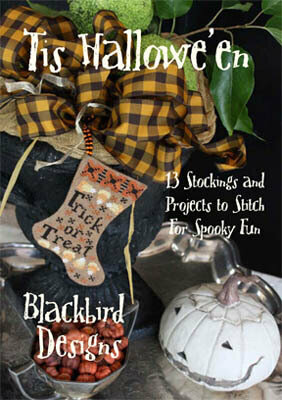 From Candy Corn to Deadly Nightshade, this small publication has what you need to celebrate one of our favorite holidays. 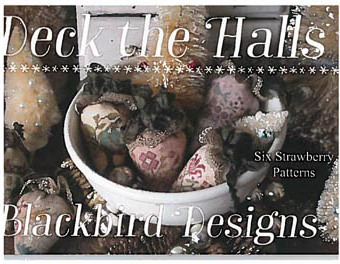 Patterns for 13 stockings, a pumpkin pinkeep, and a bit of accessorizing bling are all at your fingertips. We'll even let you in on our little secret for giving your pins the vintage look we love. 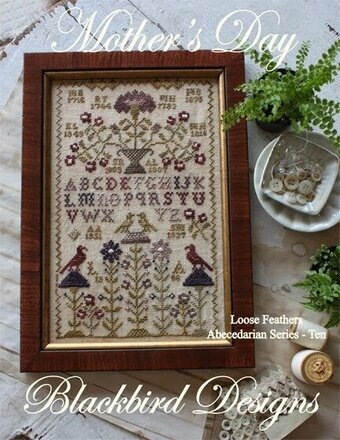 Stitched on 32 count Meadowlark by Birds of a Feather with Weeks Dye Works and Gentle Art Sampler Threads. The stitch count is 113W x 93H. Contains patterns for six strawberry patterns. "It Came Upon a Midnight Clear" stitched on 36 Ct. Putty Linen with Weeks Dye Works Amber, Baked Apple, Beige, Brick, Caper & Cocoa. Stitch Count: 77x50. "Christmas Visitor" stitched on 36 Ct. Ale linen with Weeks Dye Works Amber, Baked Apple, Beige, Caper, Graphite, Light Khaki, Oscar & Teal Frost. Stitch count: 83x54. "Christmas Cactus" stitched on 36 Ct. Sand linen with Weeks Dye Works Aztec Red, Baked Apple, Olive, Oscar, Palomino & Whiskey. Stitch Count: 72x48. "From Me to Thee" stitched on 36 Ct. Sanguine with Weeks Dye Works Beige, Olive, Oscar, Red Pear & Williamsburg Red. Stitch count: 78x45. "On the First Day of Christmas" stitched on 36 Ct. Doubloon linen with Weeks Dye Works Amber, Cadet, Caper, Cocoa, Light Khaki, Olive & Palomino. Stitch count: 83x50. "Dancing Sugar Plums" stitched on 36 Ct. Opal with Weeks Dye Works Cattail, Cranberry, Dolphin, Oscar, Pink Sand, Palomino & River Rock. Stitch Count: 81x47. Finishing instructions included. 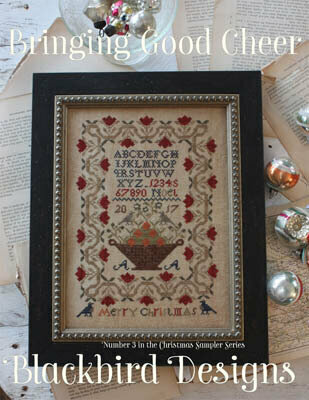 Number 3 in the Christmas Sampler series. Model stitched over 2 threads on 35 Ct. Straw linen with Weeks Dye Works floss (or DMC 935, 3777, 898, 422, 420, 336, 3790, 3012, 301). Stitch Count: 127W x 183H. Part 2 in the Loose Feathers Abecedarian Series. Model stitched on 30 Ct. American Chestnut linen with Gentle Art Sampler threads and Weeks Dye Works floss. Stitch Count: 90W x 120H. "Tweet Hearts Exemplar #1 and #2 are stitched on 32 Ct. Light Vintage Examplar using Simply Wood by Gentle Arts. Stitch count 48x53. "Be Mine Stocking" is stitched on 30 Ct. St. Valentine's Blend by R&R Reproductions using Gentle Arts Sampler Threads, stitch count 46x99. "Hearts on a Wire" stitched on 14 Ct. 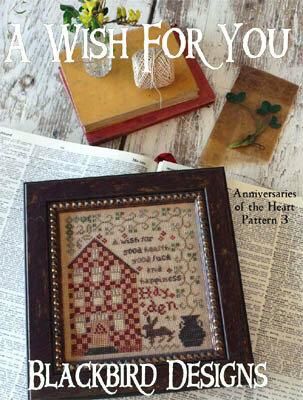 Antique Brown perforated paper using Gentle Arts Sampler threads, stitch count 13x15 for largest heart. 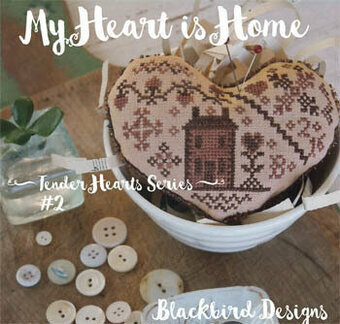 Also "Two Hearts Tag" stitched on 30 Ct. Korty's Special blend using Classic Colorworks floss. Stitch count 64x48. (or DMC 3012, 779, 3371, 844, 3860, 310, 3787). Stitch Count: 169W x 206H. 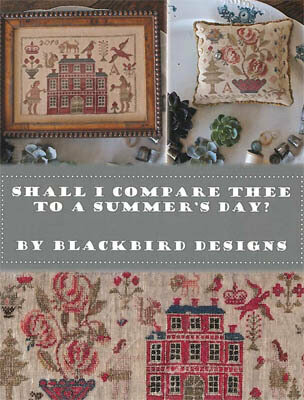 Stitched on 30 count Goldfinch Linen by R & R Reproductions with Gentle Art Sampler Threads. 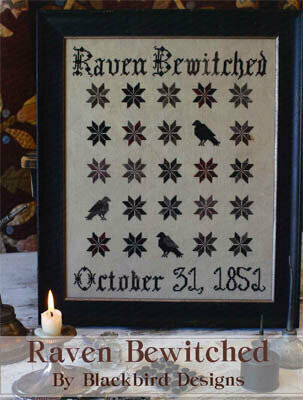 The stitch count is 107W x 130H. Model stitched on 28 count Old Mill Java by R & R Reproductions with Weeks Dye Works and Gentle Art Sampler Threads. The stitch count is 74W x 97H. Sampler stitched on 30 count linen over 2 threads using Gentle Art Sampler threads, Classic Colorworks thread & Weeks Dye Works threads. Stitch count: 135 x 135. Model stitched on 30 count Old Mill Java with Gentle Arts sampler threads. The stitch count is 162W x 102H. 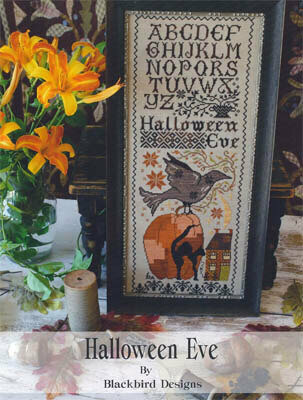 Model stitched on 35 Ct. Abcedarian Blend by R&R Reproductions with Gentle Art Sampler threads. Stitch Count: 77W x 140H. Reward of merit pincushion. Model stitched on 30 count St. Valentine's Blend by R&R Reproductions using Crescent Colours (Jakey Brown - 3 skeins needed). DMC conversion available. Stitch count: 61W x 93H. 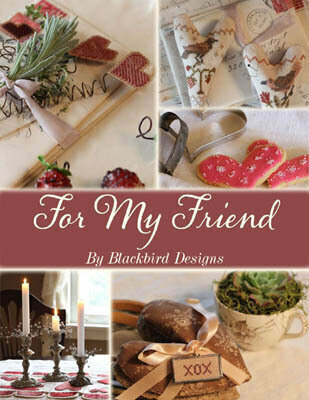 This book has 9 projects to make and give (or keep) as gifts. A Flock of Birds stitched on 28 Ct. Light grey/straw gingham linen using Classic Colorworks Belle Soie Silk floss, Stitch count 115x66. Garden Gem Pin Box stitched on 30 Ct. Old Mill Java using Classic Colorworks, Gentle Art Sampler threads and Weeks Dye Works, Stitch count 66x68. My Hanging Pocket stitched on 40 Ct. White linen using DMC floss. Stitch count 75x102. My Needle Book stitched on 40 Ct. White Linen using DMC floss, stitch count 44x49. 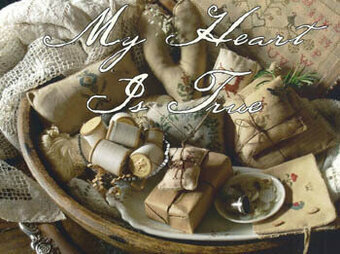 My heart is True stitched on 40 Ct. White linen using DMC floss. Stitch count 22x22, and Friends with you Project book. 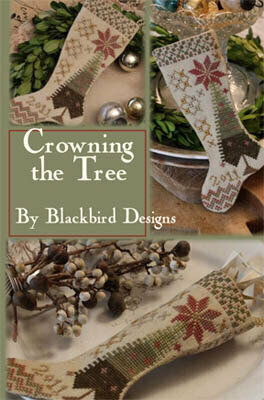 stitched on 30 Ct. American Chestnut using Classic Colorworks and Gentle Arts Sampler threads. Stitch count 77x91. Includes finishing instructions and template. Stitched on 28 count Oyster Mist by R & R Reproductions with Weeks Dye Works (Honeysuckle, Purple Haze, Cocoa, Scuppernong) and Gentle Art Sampler Threads (Bankers Grey, Parchment, Dried Thyme, Sweet Pea). The stitch count is 91W x 112H. Model stitched on 14 Ct. Antique Brown Perforated Paper with Gentle Art Sampler threads. Stitch Count: 64W x 33H. 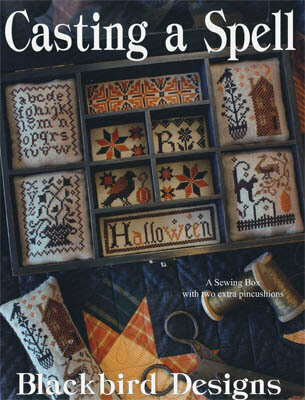 Model stitched on 30 count Apple Brown Bindy Linen by R&R Reproductions with Gentle Art Sampler Threads (Aged Pewter). Stitch count: 85W x 45H. Model stitched on 30 Ct. Creek Bed Brown linen with Classic Colorworks and Weeks Dye Works floss (or DMC 930, 926, 3722, 422, 3047). Stitch Count: 90W x 65H. Shown finished in a brown wooden box. Finishing instructions included. 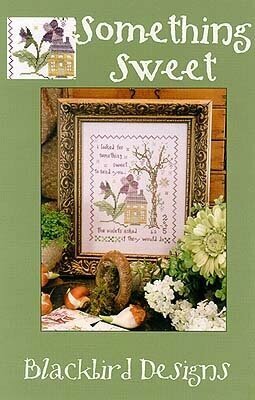 Model stitched on 30 count Old Mill Java with Gentle Arts sampler threads and DMC. The stitch count is 160W x 101H.